Well the leather sewing machine belt drive cord gave up the ghost. A little disappointing that it only lasted about three weeks of moderate use. Rather than waste my remaining leather cord, I made a trip to the Big Box and bought a fifty foot hank of 7mm solid braid polyester cord. I let you know how this stuff holds up. This next bit is about an accessory. Once I started using this lathe it became immediately apparent that it would be impossible to turn short lengths of wood or oddly shaped pieces. There would be no area on which the drive cord would run in those instances. What I needed was a drive mandrel that would serve to accommodate the cord and transfer that energy to the workpiece. After doing a bunch of searching online, I came up empty. 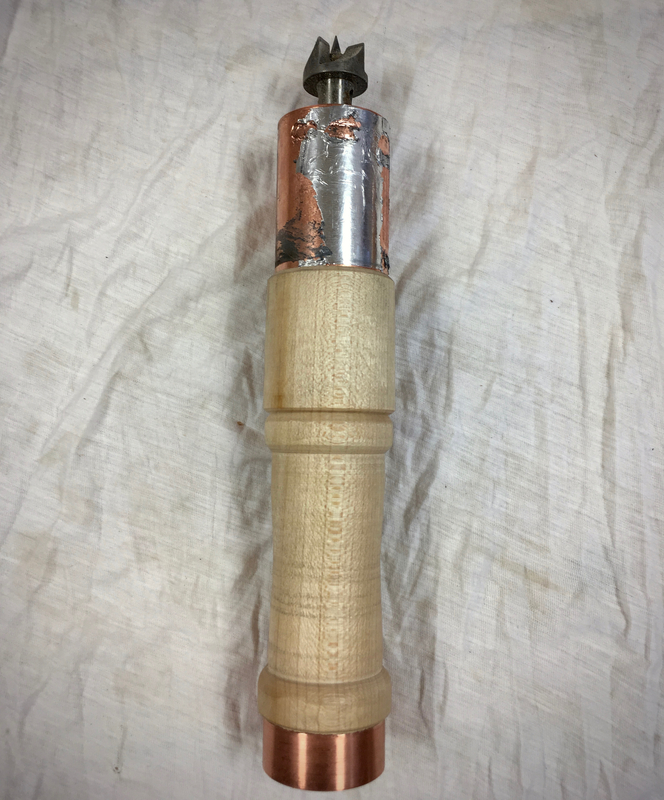 There is plenty of information to be found on creating a drive mandrel for bowl turning on a pole lathe, but practically nothing about a mandrel that was independently supported from the actual workpiece. So I did a little head scratching and sketching and came up with an idea that seemed promising. 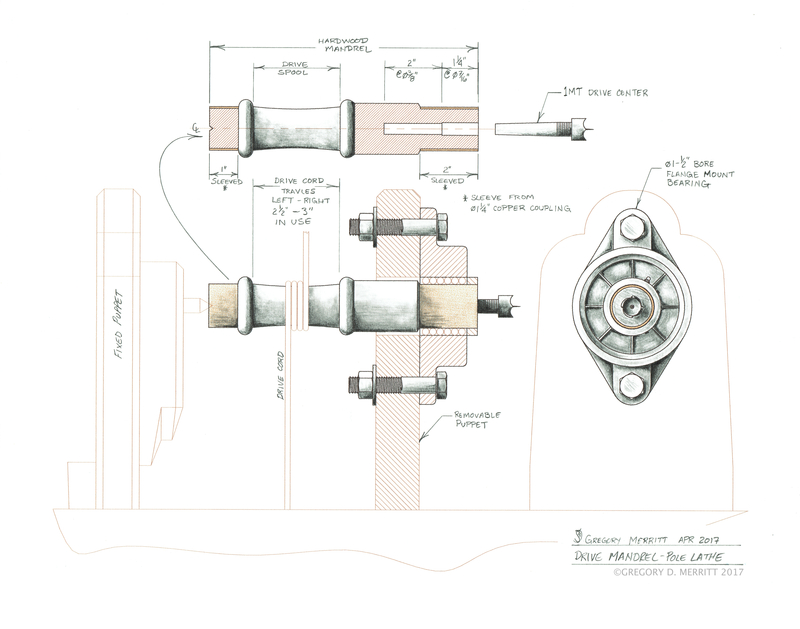 My idea is essentially the same as the drive pulley on a typical treadle (flywheel) lathe except I only need to have a bearing to support the end of the mandrel. There is no need for thrust bearings. The existing dead centers continue to serve in that capacity. In use, the drive mandrel and the workpiece are “pinched” between the existing dead centers. The bearing mounted on a removable puppet serves to support the juncture of the mandrel and workpiece. So I ordered a 1-1/2″ bore flange mount bearing and a 1MT drive center off of fleabay. The mandrel I turned from hard maple. I sleeved each end of the mandrel with copper to prevent splitting and add durability. A 1-1/4″ copper slip coupling has a 1.9ish outside diameter and was a friction fit to the bearing once I added a shim fashioned from aluminum tape. The 1MT drive center was installed in a stepped hole same as the dead centers. The tricky bit was getting everything to line up along the same centerline. Time and patience paid off and everything lines up reasonably well. The thing works great! The bearing is new and arrived somewhat stiff, so it takes a little more spring and little more effort to push the foot board. The bearing is beginning to loosen with use though. 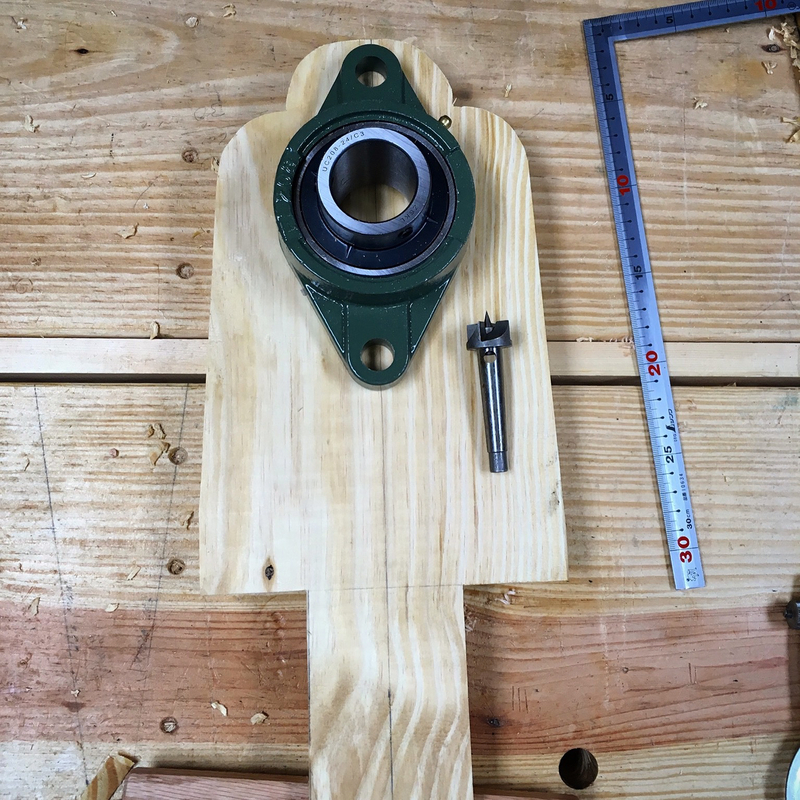 I also needed to put together a smaller tool rest. The new one is about 5″ wide and utilizes the same locking base as the the large one. 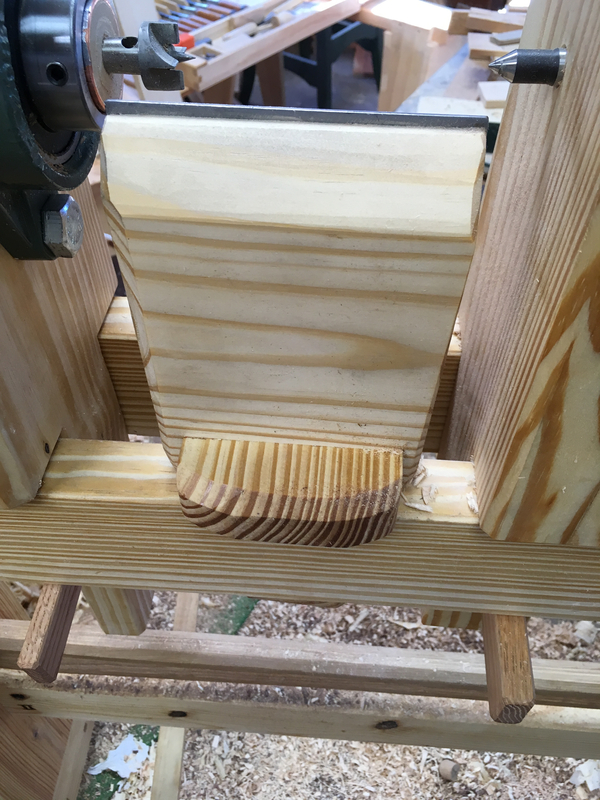 Now I can turn just about any length of wood I want. A short clip taken before the drive cord swap. 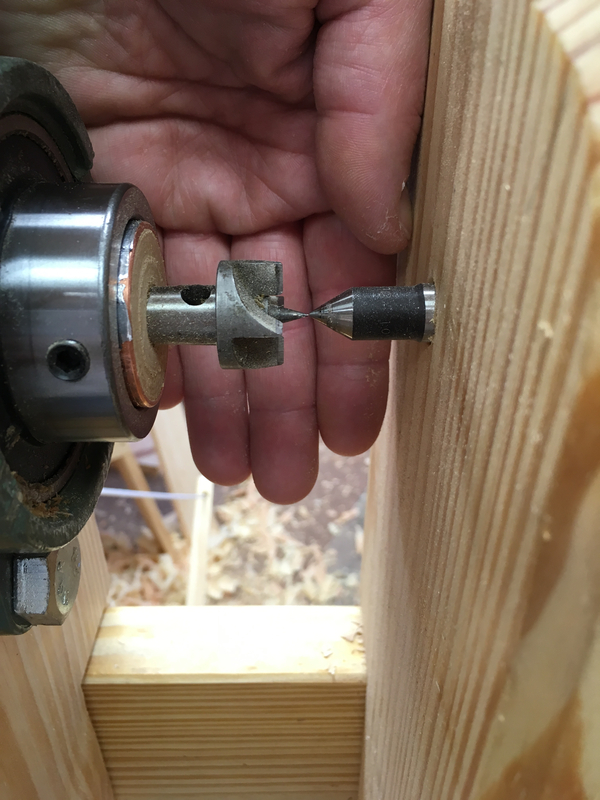 This entry was posted in 5-Tools, Spring Pole Lathe, Thoughts-Views and tagged drive cord, drive mandrel, Spring Pole Lathe. Bookmark the permalink. Do you feel like there’s more stretch to the poly cord than the leather? I’d think stretch and a bit less grip would be the concern there. I haven’t noticed any difference between the two. Both will slip with only one wrap, but with two or three wraps I can’t make it slip no matter what I do. I have a few hours turning with the poly cord, so far so good. Time will tell. It works amazingly well but it’s slow turning, I think the flywheel would of been a better option. Ha…since I don’t know any different, I’m pretty happy with what I have. It’s getting the job done and it’s portable. Interesting developments. Killer illustration plus a video. Nice blog post as well. Thanks Jeff. I’m playing around with my illustration technique a little. A mixture of CAD and handwork. Not entirely sure about though. Jarrod Stone Dahl was doing a live instagram w his pole lathe, I asked him about his drive cord. He uses starter rope, which is supposedly better suited to withstand the abrasion. He also said there’s some technique involved, he burned through cords at first, then learned not to. 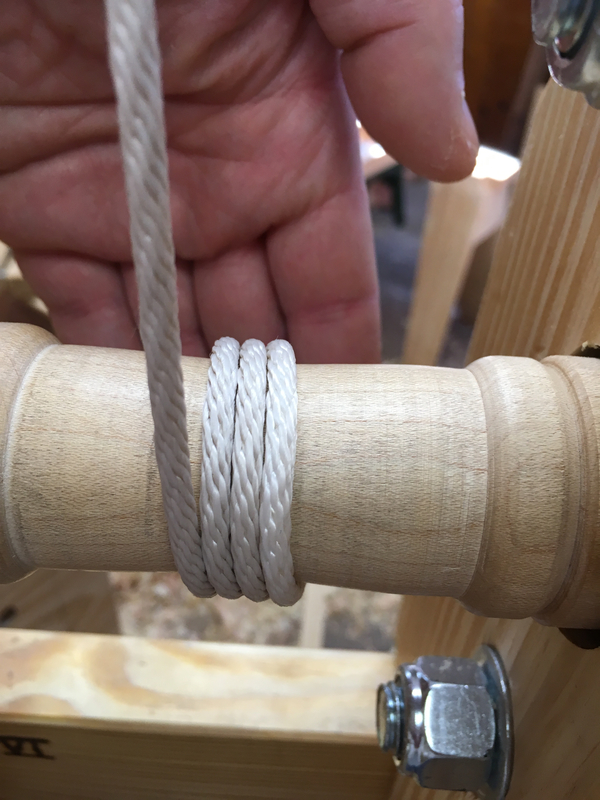 I have already snapped the leather cord on my lathe a couple of times, and am looking for a better way, maybe the poly cord will work. Thanks for all your documentation! Did a search for “starter cord”, that’s a whole other rabbit hole. I’ll put it on the list to try if this cord doesn’t hold up. The leather cord is out for good. It looks nice, but just isn’t up to the task. Hi Greg, I found that the wear on my cord was entirely due to it rubbing against itself and I’m thinking that since you’re using a separate fixed “drive shaft” rather than the piece itself, maybe it could be lightly threaded? I’m imagining that it the cord was resting in grooves, the wraps could have slight gaps between them and not be bunched together in the narrowest section. In theory, what you propose would work. In practice though, I doubt that you would be able to keep the cord tracking in the grooves. I only plan to use this drive mandrel for short pieces and odd shaped pieces that won’t allow direct use of the drive cord. I have a feeling that the drive cord may be an ongoing issue. Hopefully not, but time will tell. I’m planning an upgrade to my bench pole lathe since I started using it! Until now the Bob Easton was a winner design specially after the “jig saw add on”. Yes yours don’t have the continuous movement, on the other hand it’s light, collapsible, portable, and that removable puppet is kind of a genius moment! You’re making me scratch my head a lot! In a god way! Warning I may steal 1 or 2 ideas from you! Take what you need Antonio, that is why I put it on here. With the addition of the drive mandrel for short and odd shaped pieces, there is very little that I can’t turn on this lathe. Factor in the portability and it is a hard combination to beat for the occasional turning project. You’ve given me the itch to build one, Greg. It’ll have to wait at the end of the list, which is getting longer and longer. Awesome! I don’t think you will regret it. I wish I had built one years ago.